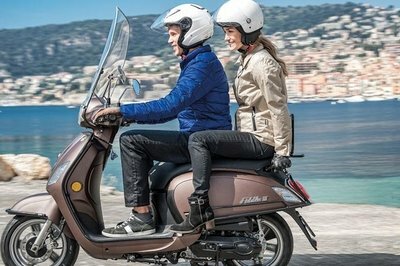 The Vespa Primavera got a facelift in 2015 and debuted as Vespa’s hot ticket for the 150 cc U.S. market and a modern yet retro entry in the 50 cc market. 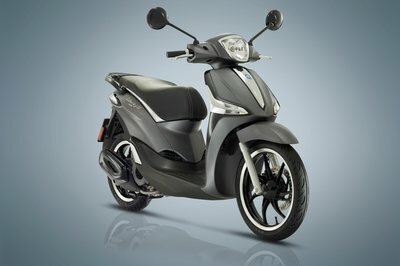 The three-valve 150 cc engine gets a lot better gas mileage than the previous incarnations, so using this snazzy-looking scooter as a commuter is even better now. Speaking in terms of the fit-and-finish of the Primavera, this is possibly the best scooter out of Vespa for a while now. It’s classy and classic, elegant and sophisticated; that’s something I don’t always get to say about a scooter. New badging harkens back to the original Primavera in the late 60s, so the whole look of the scooter is modern-old...or classic-new, however you want to look at it. 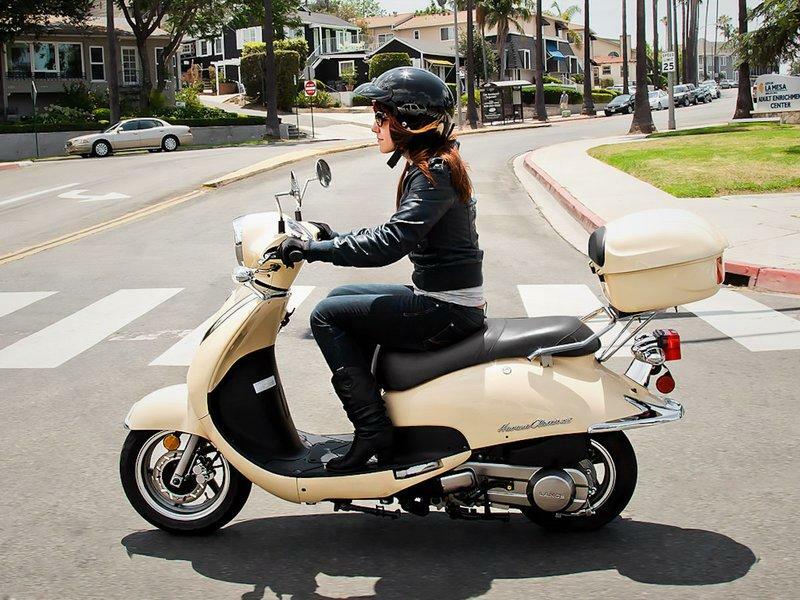 Continue reading for my review of the Vespa Primavera. Chrome accent trims and overall fit and finish of the front end give the Primavera an elegant and classy look. Taking cues from the 946, the Primavera has the curvy lines and indent panels that continue that look over the back end. Molded-in taillights and a sloping brake light keep the lines clean and put a modern touch on an otherwise vintage style. Very nice instrument cluster; kinda reminds me of the classic car dash panel, so yeah, I really like it. A combination of analog and digital, the speedometer is a grand sweeping analog gauge. The fuel monitor is a bar gauge rather than the woefully inaccurate needle. 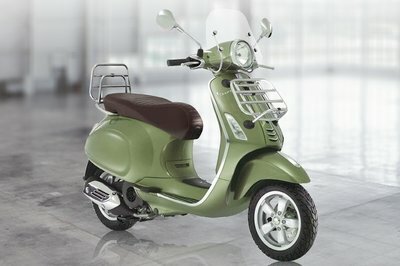 It goes without saying that scooters have a good amount of storage, but there are a couple of noteworthy things to say about the Primavera. The front glovebox is quite roomy — more than just a hole to stash your wallet — and the removable cargo bucket under the seat comes with a molded carpet insert. That’s a nice touch. If you’ve had scratches show up on your helmet after stashing it in the cargo bucket or if you took out your spare helmet that’s been riding around in the underseat storage only to be dismayed that there’s now a patina of scratches on it, you’ll appreciate the carpet insert. The seat also gets a few niceties. There is a button on the console to release the seat so you don’t have to take the key out — yay that — and the seat is fitted with a spring-loaded shock so it stays open. Now you have two-hands-free rummaging in the cargo bucket without the seat falling on your head. A step up from other Vespas, the Primavera has a lot less front-end dive when applying the brakes. Although the Primavera can be had in a couple of different engine sizes, the chassis are nearly identical with only slight differences to accommodate the different mills and their accompanying fuel tanks. Rather than use an underframe with body panels, the sheet metal body paneling itself forms a monocoque/unibody structure that is self-supporting by virtue of the stressed skin, with the appropriate balance of flex and stiffness engineered right in. Both models use a single-arm suspension for the front tire with a coil-over monoshock on damping duty that provides 3.07 inches of wheel travel. Rear suspension is a little different between the two. The 50 cc version comes with a vanilla monoshock and 2.71 inches of travel, while the 150 cc model comes with a little more travel at 2.75 inches and a four-position, spring-preload adjuster. A step up from other Vespas, the Primavera has a lot less front-end dive when applying the brakes. Die-cast, aluminum hubs mount the 11-inch tires with a 110/70 hoop up front and a 120/70 in back, all very symmetrical, but not very big. A 200 mm brake disc and hydraulic caliper slow the front wheel, and an ABS feature modulates brake pressure to prevent slippage due to overbraking or slippery surfaces. The rear tire is slowed by a 140 mm, mechanical drum brake, and as you might expect, it comes sans ABS and that’s plenty OK in my book, especially given how small and light these rides are. The differences between the engines go far beyond just displacement. 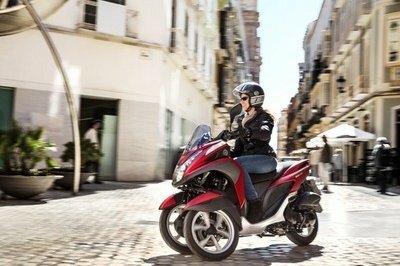 While the Primavera 50 uses the old, four-cycle “Hi-Per4” mill, Vespa's new “i-Get” plant powers the Primavera 150. First, let’s discuss the 50. Actual displacement is 49.9 cc, and it runs a bit undersquare with a 39 mm bore and 41.35 mm stroke with forced-air cooling to deal with the waste heat. A carburetor manages the induction, while a three-way catalytic converter cooks off the emissions. The mill comes with both kick- and electric-start systems, so you can have a little backup, or at least look cool kicking it to life when you feel like it. This little thumper cranks out 2.8 pound-feet of torque at 8,000 rpm and 4.6 horsepower at 9,500 with a dry, centrifugal clutch and continuously-variable transmission (CVT) to finish the swing-mount assembly for a top speed around 40 mph and fuel efficiency around 90 mpg. Now for the 150, with its sleek new i-Get engine. This is a modular engine, which in this case means it can be set up for liquid or air cooling, and can run on a three-valve or four-valve head. With this kind of flexibility, it’s easy to use this engine family to power any number of scooter-type rides, and the i-Get comes Euro4 Multi-Directive emissions compliant. The Primavera 150 jug measures out nearly square with a 58 mm bore and 58.6 mm stroke, for a total displacement of 155 cc when you add in the combustion chamber. A SOHC times the three-valve head, and electronic fuel injection manages the mix with the aid of an engine control unit (ECU) that measures air pressure and automatically leans or fattens the mix as necessary, a nice touch if you ride in areas with what you could call a lot of up-and-down. Forced-air cooling carries off the heat, but the engine drops the kicker in favor of a push-button-only start. All this leaves us with 9.4 pounds of grunt at 6,500 rpm, and 12.7 ponies at 7,750 for a top speed of 61 mph at 98 mpg out of the same CVT arrangement. 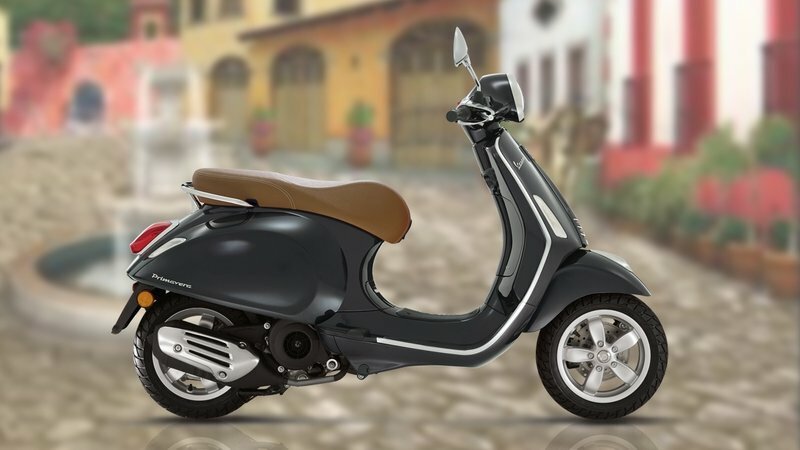 With no price increase for 2018, the Primavera stays competitive for the up-scale scooter market. 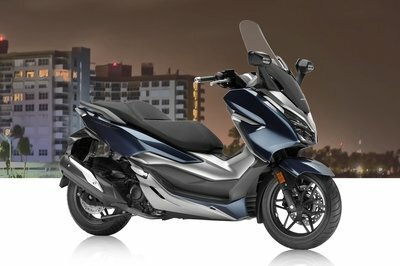 MSRP on the 2018 Primavera 50 is $3,799 and the 150 model runs $5,099 - same as last year and both just $200 over 2016. Vespa gives you a two-year unlimited-mileage warranty and one year of roadside assistance on your new Primavera. The Primavera has such nice fit and finish, I'd pick that for my wishlist, but the Lucky II is an affordable alternative. There are plenty of 150 cc scooters out there. In keeping with the look, Lance comes to mind with its Havana Classic. 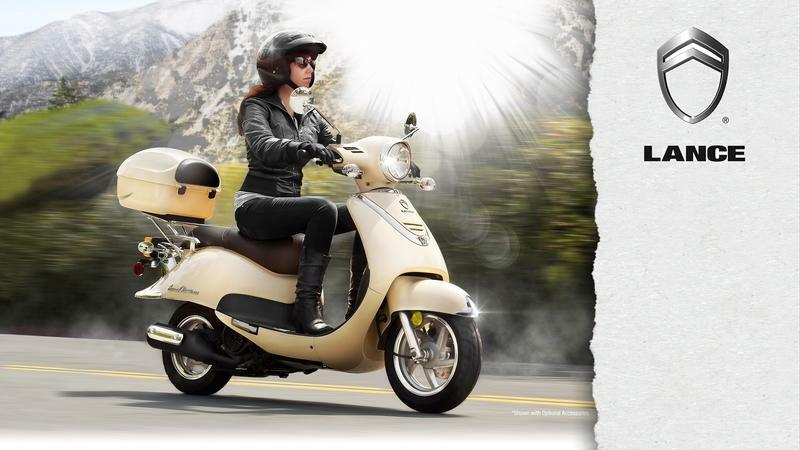 Vespa, and its parent company Piaggio, are obviously some of the biggest names in small rides the world over. 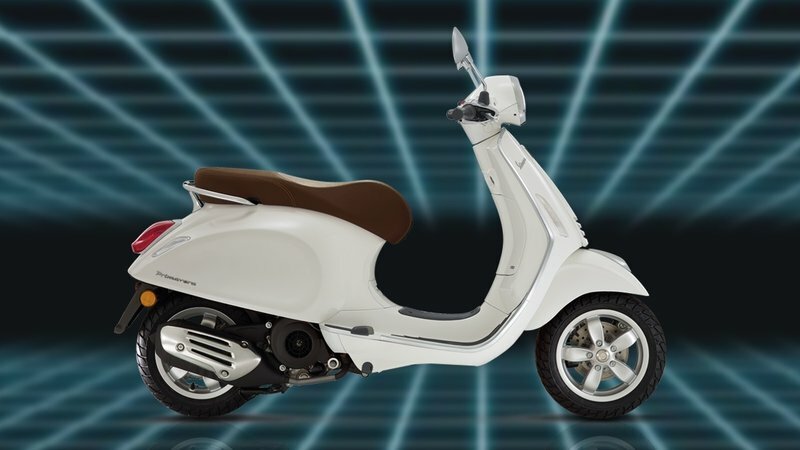 Deep pockets fund the R&D and publicity that keep them big, so I decided to take a look at one of the smaller companies that are in direct competition with Piaggio. 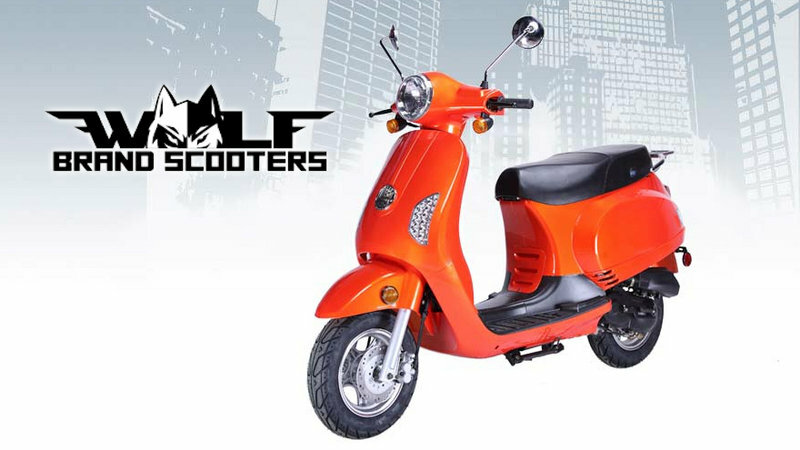 This time around I picked the U.S.-based Wolf Brand Scooters. 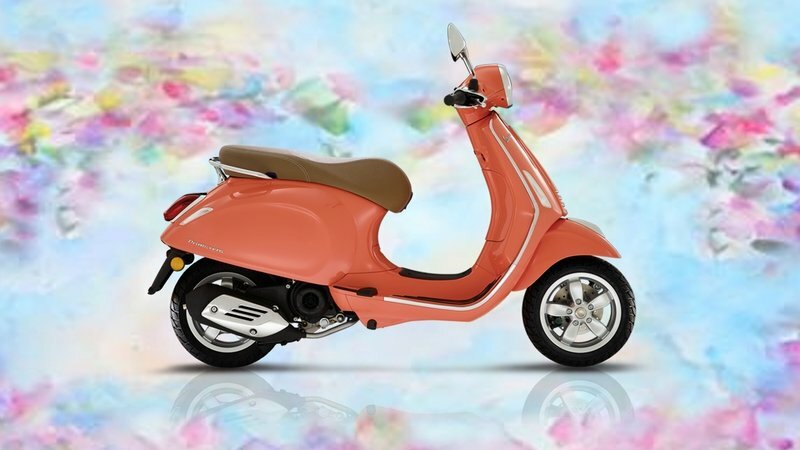 Looks-wise, the Vespa has more curves and swank with a definite Italian flair that is impossible to ignore, and although the Lucky does get close to the general look, the devil is in the details. But that’s just the point, it’s the details. If I take my glasses off and back up 100 feet, I’d be hard pressed to see the differences, and so will most folks. While it’s hard to beat that Eye-tie panache, bless Wolf for making a fair attempt at it. OK, enough of vanity, let’s get to the important stuff. Chassis hardware is relatively close in nature and capabilities. Obviously, they both run the scooter-typical, swing-mount motor unit with a hidden monoshock on damping duty, but while the Vespa runs a nifty-looking, single-side swingarm and shock for the front wheel, Wolf opts for the traditional dual hydraulic-fork method that, frankly, is a little more confidence inspiring. Too bad the tires on the Lucky are a whole inch smaller than the already-too-small, 11-inch wheels on the Primavera. Brakes are comparable with juice up front and mechanical drum in back, but Vespa alone offers ABS. Not a deal breaker, but there it is. Obviously the Lucky won’t be sporting a fancy new modular mill like the Primavera, but it does come with an engine that is on-par with scooter motors around the world. Displacement difference is less than one cube, and both mills are air cooled for simple and light construction. Wolf holds its cards close to the vest when it comes to power figures, but they do give the bottom line as far as I’m concerned; 55+ mph at 75+ mpg. Comparable top speed to the Primavera, but unsurprisingly, less in the way of mileage. I’m calling the mills close, but with an advantage to Vespa. Wolf gets its biggest win by far at the checkout counter. 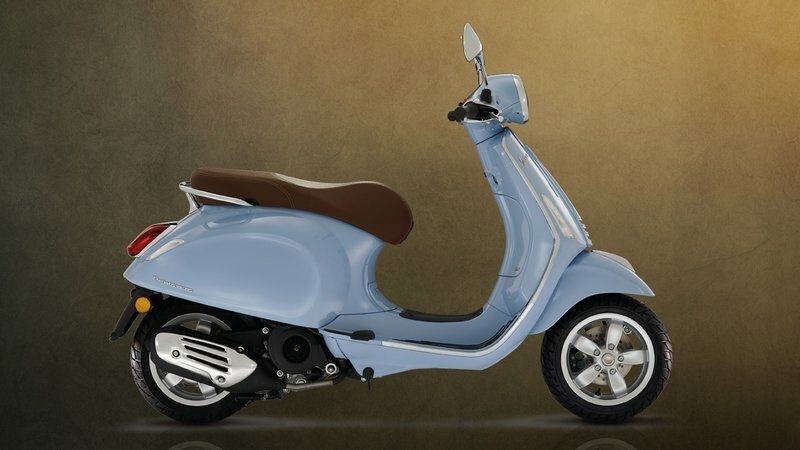 The Lucky II can be had in five different colors for a low $1,699, while Vespa comes off looking way too proud of the Primavera with its $5,099 sticker. Vespa is sort of like the Harleys of the scooter world in that you can expect to pay a premium for their products, so this price difference was to be expected. Still, the Primavera has such nice fit and finish, I’d pick that for my wishlist, but the Lucky II is an affordable alternative. Rear tire: Die-cast aluminum allow, Tubeless 120/70 - 11" Die-cast aluminium alloy , Tubeless 120/70-11"
See our review of the Lance Havana Classic.